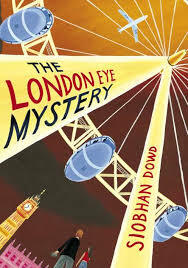 Summary: When their cousin Salim, visiting from Manchester, goes up in the London Eye (sort of like a gigantic Ferris wheel overlooking the city) but does not come back down, 12 year-old Ted and his older sister Katrina decide to figure out what happened . As Ted describes it, his brain runs on a ‘different operating system’ from most people – he isn’t very good at recognizing emotions, reading body language, or understanding slang, but his way with facts and puzzles might be just the right kind of thinking to find the missing Salim. This book isn’t just about Asperger’s syndrome: First and foremost it is a terrific, fast-paced mystery. It happens to also be a great choice for people looking for stories with differently-abled heroes. Ted’s charm and humor shine through as he learns to cooperate with his surly sister and ‘see things differently’ as they hunt for their missing cousin. This is a fun read, and like any great mystery, it will keep you guessing right up to the end! Who will like this book? : Fans of fast-paced, but not terribly intense mysteries. Readers who get a kick out of British authors and stories. People interested in learning more about the way teens with Asperger’s think. If you like this, try this: Another book featuring a teens with Asperger’s is The Very Ordered Existence of Merilee Marvelous by Suzanne Crowley. For mature readers, check out The Curious Incident of the Dog in the Night-time by Mark Haddon and the non-fiction Look Me in The Eye: My Life with Asperger’s by John Elder Robinson. This entry was posted in Mysteries and Thrillers and tagged brothers, disabilities, mystery, quest, sisters. Bookmark the permalink. I want to know the characters!!!!!!!!!!!!!!!!!!!!!!!!!!!!!!!!!!!!! !